Kostomarov, Mykola [Костомаров, Микола; pseuds: Єремія Галка, Іван Богучаров (Iieremiia Halka, Ivan Bogucharov)], b 16 May 1817 in Yurasivka, Ostrohozke county, Voronezh region, d 19 April 1885 in Saint Petersburg. Historian, publicist, and writer. He graduated from the Voronezh gymnasium and then in 1837 from Kharkiv University. From 1844 to 1845 Kostomarov taught history at the Rivne and at the First Kyiv gymnasiums. In 1846 he was appointed assistant professor in the Department of Russian History at Kyiv University. 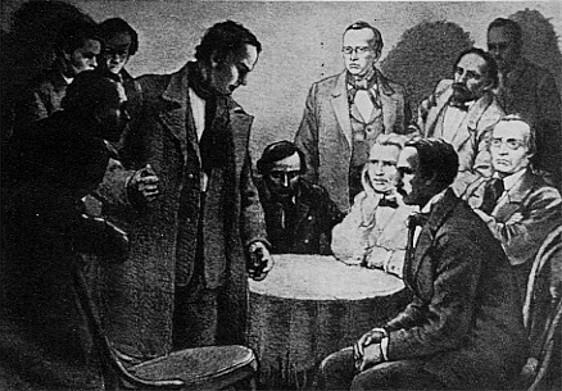 That year, along with Vasyl Bilozersky, Panteleimon Kulish, Mykola Hulak, Taras Shevchenko, and others, he formed the Cyril and Methodius Brotherhood. In Knyhy bytiia ukraïns’koho narodu (Books of the Genesis of the Ukrainian People), Ustav Slov'ians’koho tovarystva sv Kyryla i Metodiia: Holovni ideï (The Statute of the Slavic Society of Saints Cyril and Methodius: Its Main Ideas), and two proclamations, Kostomarov formulated the society's program and basic ideas: Christian piety, democratic republicanism, a Ukrainian national renaissance, Ukrainian messianism, and Pan-Slavic federalism. In 1847 he was arrested along with all the other members of the society and sentenced to one year's imprisonment in the Peter and Paul Fortress in Saint Petersburg, followed by exile. 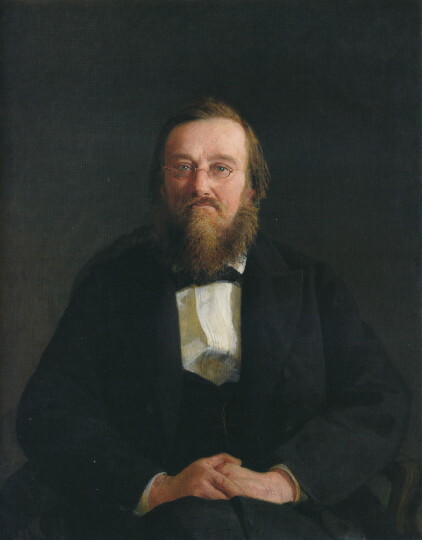 Until 1856 he lived in exile in Saratov, serving as a chancellery clerk. Three years later he moved to Saint Petersburg, where he was appointed to the Chair of Russian History at the university. 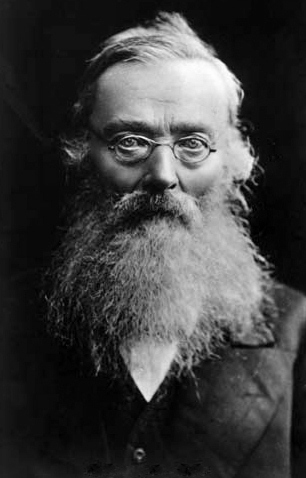 Because of his political involvements he had to resign his university position in 1862 and could not accept offers from other universities. From then on he devoted himself exclusively to research. 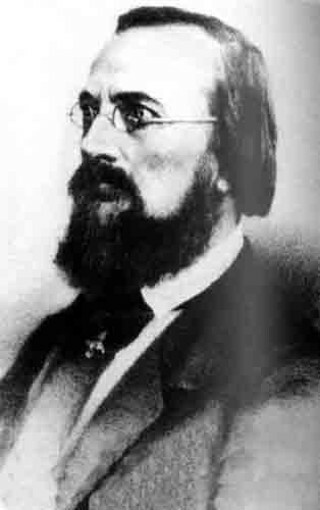 Kostomarov wrote a number of fundamental works on the history of Ukraine in the 16th–18th centuries. 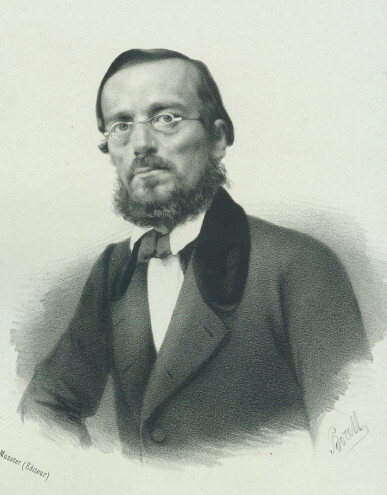 Among them were Bogdan Khmel’nitskii i vozvrashchenie Iuzhnoi Rusi k Rossii (Bohdan Khmelnytsky and the Return of Southern Rus’ to Russia, 1st edn in Otechestvennye zapiski, 1857, vols 110–13; 2nd edn in 2 vols, 1859; 3rd edn in 3 vols, 1876), Ruina, istoricheskaia monografiia iz zhizni Malorossii 1663–1687 gg. (The Ruin: A Historical Monograph on the Life of Little Russia from 1663 to 1687, 1st edn in Vestnik Evropy, nos 4–9  and nos 7–9 ), and ‘Mazepa i Mazepintsy’ (Mazepa and the Mazepists, in Russkaia mysl’ [1882–4]). These works are based on extensive documentary material that, as a member of the Saint Petersburg Archeographic Commission, Kostomarov collected in Saint Petersburg and Moscow archives and partly published in Akty, otnosiashchiesia k istorii Iuzhnoi i Zapadnoi Rossii (Documents on the History of Southern and Western Russia, 10 vols, 1861–78). He also wrote a series of books on Russian history. His historical monographs and articles were published by the Literary Fund in Saint Petersburg. Its last edition of his works, in eight volumes, came out in 1903–6. 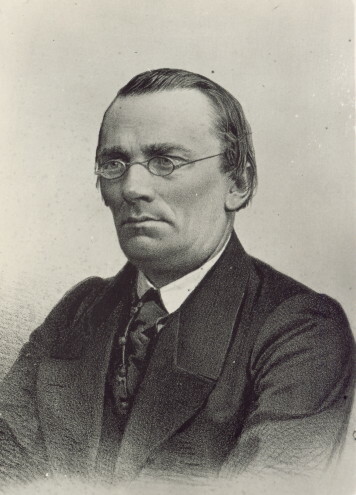 He was the author of Russkaia istoriia v zhizneopisaniiakh eia vazhneishikh deiatelei (Rus’ History in the Biographies of Its Important Figures, 1874–6), which was devoted mostly to Ukrainian historical figures. 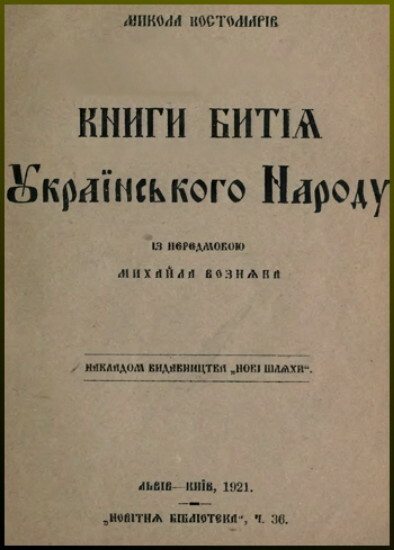 This work was translated into Ukrainian and published in the journal Pravda and separately under the title Rus’ka istoriia v zhyttiepysakh ïï naiholovnishykh diiateliv (1875–7), then republished as Ukraïns’ka istoriia v zhyttiepysakh ïï naiznamenytnishykh diiachiv (1918). Kostomarov was the founder of the populist trend in Ukrainian historiography. He believed that the purpose of the historical sciences was to describe the past of human communities. In his historicophilosophical studies, such as ‘Mysli o federativnom nachale v drevnei Rusi’ (Reflections on the Federative Principle in Ancient Rus’), ‘Dve russkie narodnosti’ (Two Rus’ Peoples), and ‘Cherty narodnoi iuzhnorusskoi istorii’ (Characteristics of Popular South-Rus’ History), which were all published in Osnova (Saint Petersburg), nos 1–3 (1861), and in his journalistic articles, such as ‘Pravda moskvicham o Rusi’ (The Truth about Rus’ for Muscovites), ‘Pravda poliakam o Rusi’ (The Truth about Rus’ for Poles), and his letter to the editor of Kolokol in 1860, as well as in his historical monographs, Kostomarov argued for the national distinctiveness of the Ukrainian people and the uniqueness of their historial development, which, unlike for the Poles and Russians, was manifested in the Ukrainian freedom-loving, democratic, and individualistic spirit. The same ideas formed the basis of his ethnographic research. He published a series of ethnographic studies, including ‘Istoricheskoe znachenie iuzhnorusskogo narodnogo pesennogo tvorchestva’ (The Historical Significance of the South-Rus’ Folk Song Tradition, in Beseda, vols 4–12 ) and ‘Istoriia kozachestva v pamiatkakh iuzhnorusskogo narodnogo pesennogo tvorchestva’ (The History of the Cossacks in the Monuments of the South-Rus’ Folk Song Tradition, in Russkaia mysl’, nos 1–8 , nos 7–8 ), and he edited vols 3, 4, and 5 of the papers of Pavlo Chubynsky's ethnographic and statistical expedition to Right-Bank Ukraine. 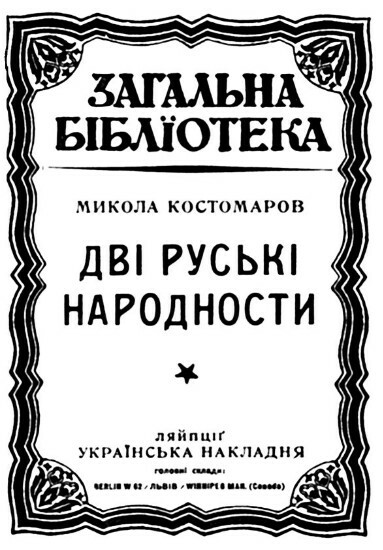 Some of Kostomarov's ethnographic works were republished by Mykhailo Hrushevsky in a separate collection, Etnohrafichni pysannia (Ethnographic Writings, 1930). Kostomarov's numerous journalistic articles appeared in the 1860s–1880s in such journals as Osnova, Otechestvennye zapiski, Sovremennik, and Vestnik Evropy. 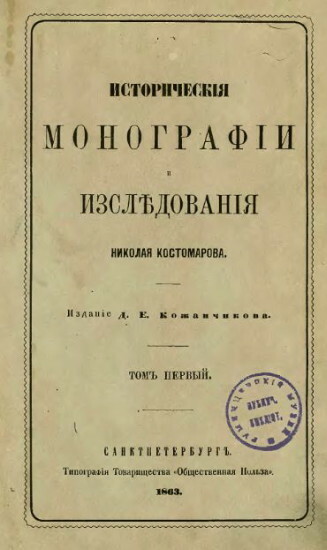 Some of them were collected and republished by Hrushevsky as Naukovo-publitsystychni i polemichni pysannia Kostomarova (Scholarly-Publicistic and Polemical Writings of Kostomarov, 1928). As a writer, Kostomarov is classified as a member of the Kharkiv Romantic School. 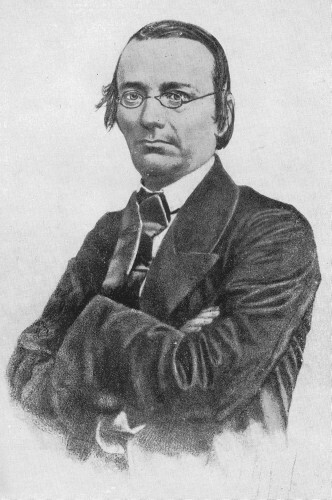 His poetry collections, Ukraïns’ki baliady (Ukrainian Ballads, 1839) and Vitka (The Branch, 1840, both published under the pseud Iieremiia Halka), contain historical poems about the Princely era and the Bohdan Khmelnytsky period (eg, ‘Did pasichnyk’ [The Old Beekeeper]). The language of his poetry is marked on the one hand by an extensive use of the vocabulary and phraseology of folk songs, and on the other by a striving to elevate it to the level of a literary language. 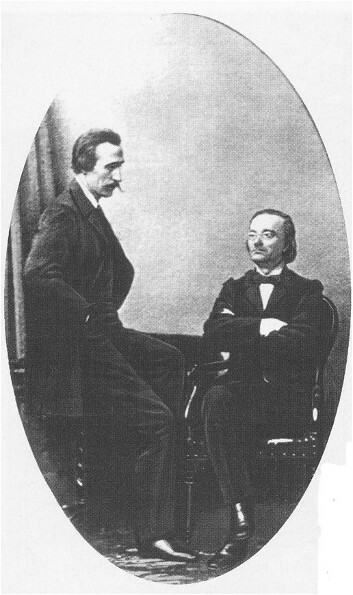 His historical dramas, Sava Chalyi (1838) and Pereiaslavs’ka nich (The Pereiaslav Night, 1841), are attempts at ‘high tragedy.’ Lacking in dramatic qualities, however, Kostomarov's plays have left no noticeable mark on the subsequent development of the Ukrainian theater. His prose written in Russian (the novelette Kudeiar, 1875) or in Russian interspersed with dialogues in Ukrainian (Chernigovka, 1881) is even less significant than his dramas. His literary works were published in two volumes in 1967. A bibliography of his works appeared in Kostomarov N.I. : Literaturnoe nasledie (Kostomarov N.I. : The Literary Legacy, 1890). A referral to this page is found in 72 entries.